(Latest Updated on 08.01.2019). CTET Answer Key Dec. 2018 are available here to download for Paper-I & Paper-II as CBSE uploaded Final CTET Answer Key DEC 2018 exam 09.12.2018 as CTET Answer Key 2018. CTET Answer Key DEC 2018 exam held on 09.12.2018 can be checked here after the exam as the official & final answer keys are available at official website of CTET i.e. www.ctet.nic.in. CBSE conducted CTET December 2018 exam on 9th December 2018. Here you can get CTET DEC 2018 Official Answer Key exam held on 09.12.2018 for Paper 1& Paper 2. Answer key of CTET Dec. 2018 exam 09.12.2018 for both paper-1 (class 1st-5th) & paper-2 (class 6th-8th) can be downloaded here after the exam. CTET DEC 2018 Exam was held on 09.12.2018. Official answer key of CTET 2018 exam was released on 28.12.2018 as per the schedule. CTET Final Answer key of 09 December 2018 exam has also been uploaded and can be checked here after the exam. Answer Key Challenge - The Candidates willing to challenge any answer given in the Answer key displayed by CBSE may do so by submitting their challenges online on the prescribed format by clicking the link available on CTET website up to 30th December 2018 midnight. Answer key of CTET Sept. 2016 exam 18.09.2016 for both paper-1 (class 1st-5th) & paper-2 (class 6th-8th) can be downloaded here after the exam. CTET SEPT 2016 Exam was held on 18.09.2016. Official answer key of CTET Sept. 2016 exam was released on 15.10.2016. CTET Answer key of 18 September 2016 exam can be checked here after the exam. Answer key of CTET May 2016 exam 08.05.2016 for both paper-1 (class 1st-5th) & paper-2 (class 6th-8th) for Haryana state is available here after the exam. CTET FEB 2016 Exam 21.02.2016 was postponed in Haryana state. Postponed re-exam (CTET Haryana) was held on 08.05.2016 for the candidates of Haryana state. CTET Answer key of 8 May 2016 exam can be get here after the exam. CTET February 2016 exam was conducted on 21.02.2016 for paper-1 (class 1st-5th) & paper-2 (class 6th-8th) to ascertain the eligibility for the post of teacher to be recruited in government and private schools affiliated to Central Board of Secondary Education (CBSE). Answer key of CTET Feb. 2016 can be get here after the exam. CTET Answer Key February 2016 are available here after the exam. Official answer key of CTET exam 2016 has been uploaded by CBSE on 14.05.2016 and will be available up to 16.05.2016. So, here you can download official answer key of CTET Exam 21.02.2016. Earlier we had provided tentative and unofficial answer key of CTET 2016. Here you can get answer key of CTET Feb. 2016 exam for all parts of Paper-1. As you know that both CTET Paper-I contain 150 multiple choice questions and candidates are required to solve all the questions. Candidates of CTET 2016 can get an idea about their score card of CTET Feb. 2016 with help of CTET FEB. 2016 Answer Key. CTET Answer Key of Feb. 2016 for Paper-II contains 150 answer options. There were 150 objective type MCQ which were all compulsory. Candidates were required to attempt all questions to get maximum marks in Paper-II of CTET 2016 exam held on 21.02.2016. CTET Answer Key Feb. 2016 for Paper-II can be get here after the exam at the below link. 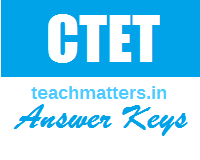 Answer Key of CTET Sept. 2015 exam have been uploaded by CBSE on the official website i.e. www.ctet.nic.in. Candidates can download CTET answer key of Sept. 2015 exam at the below links for Paper-1 & Paper-2 (all sets). CTET Result 2016 will be declared on the basis of Cut-off Marks fixed for category-wise. General candidates are required to secured minimum 60% (90 marks) to qualify Central Teacher Eligibility Test. Eligibility Certificate will be issued to all those candidates who secured 60% or more marks. You can get news about Result of CTET 2016 here as soon as possible. Here you can download CTET answer key for paper-1 and paper-2 of previous years exams. See/check answer keys at the below links.